The LyoStar™3 is a reliable, robust Lyophilizer designed with the needs of the research and cycle development scientist in mind. It offers design characteristics similar to large production freeze dryers to facilitate scale-up and down, backed by unmatched process accuracy, reliability and unique ease-of-use features. 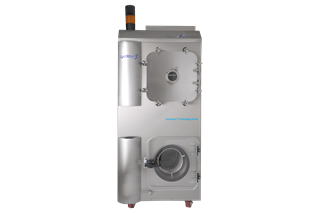 The optional SMART™ Freeze Dryer technology offered in LyoStarTM3 helps automate and shorten the development of freeze-drying cycles delivering product information that has been previously unavailable during a cycle-dried layer resistance, heat flow and mass transfer. SMART™ is an ‘expert system’ for freeze drying that allows optimization of primary drying from the first laboratory experiment. Based on operator inputs, SMART™ suggests a default freezing program, utilizing Control Lyo™ Technology or can accept a custom freezing recipe designed by the scientist. The system monitors product temperature at regular intervals, calculating how much heat to add via the shelf to quickly bring the product to its target temperature. This is followed by selection of optimum chamber pressure & shelf temperature and subsequent identification of the end of Primary Drying followed by automatic initiation of the Secondary Drying.SMART™ eliminates iterative trial and error approach and case studies have shown reduction in cycle development times by as much as 79% and annual cycle development costs by 60%. The Control Lyo™ On-Demand Nucleation Technology achieves significantly less variation in the degree of supercooling producing larger ice crystals which in turn gives less product resistance and faster drying times. The technology enables controlled ice nucleation besides reducing the primary drying time, improves cake appearance, cake morphology, reduced specific surface area, vial-to-vial homogeneity as accepted by even FDA. The first to offer product resistance information….